Metropolis at Metrotown Target Anchor Replacement Revealed: Many have been wondering what will replace the former Target anchor store space at Metropolis at Metrotown in Burnaby, just east of Vancouver. Target occupied about 116,700-square -feet in the centre and the store closed in the spring of 2015, coinciding with Target’s devastating exit from Canada that resulted in thousands of job losses and millions of square feet of vacant retail space. Target anchored a wing in the mall which has seen some significant changes. Japanese fast-fashion retailer Uniqlo opened its largest BC store last year nearby in the mall’s Centre Court, and Muji opened nearby. Other popular recent additions include Uncle Tetsu’s Cheesecake, Deciem, Urban Decay, and several other first-to-market retailers. Metropolis at Metrotown is one of Canada’s most productive malls in terms of sales per square foot according to Retail Council of Canada’s Shopping Centre Study. It’s also one of Canada’s largest malls in terms of square footage, as well as one of its busiest in terms of annual footfall. For those wondering what will replace Target, Walmart is the answer — the store has been under construction for the past several months, and its opening date is expected to be announced shortly. Walmart joins Hudson’s Bay as an anchor to the centre — Sears also had a large store at Metrotown, but Sears Canada has since closed all of its Canadian stores after the company declared bankruptcy last year. Malls are in a state of transition and landlords are trying to determine what to do with vacancies. Gensler Appoints New Director of Retail Design: Global design firm Gensler has announced that it is expanding its retail practice area in Canada with the appointment of Andrew Gallici. He is a design professional with more than 25 years of experience in designing award-winning retail environments. Since earning a Bachelor of Arts in interior design from Ryerson University, Gallici has created unique retail experiences of all sizes and formats around the world, from boutiques to shopping centres, garnering recognition from ARIDO, Canadian Interiors and Shop! Awards, to name a few. Project highlights include: La Maison Simons department stores across Canada; TELUS Mobility’s Connected Experience Store Model; and key areas of the Dubai Festival City shopping centre. Since establishing Gensler’s Canadian presence in 2011, the Toronto office has quickly grown to more than 100 employees who work across the firm’s 16 global practice areas in the work, lifestyle and community sectors. High profile Canadian work includes Holt Renfrew and Hermès. Gensler Toronto’s retail practice has grown an average of 330% per year and retail projects accounted for 10% of work across the firm last year. Gensler is a global design firm with more than 5,200 practitioners networked across 46 offices. Recent accolades: For the sixth consecutive year, #1 on Interior Design’s Top 100 Giants 2018 and #1 in Retail Design; #1 in Building Design’s World Architecture 100 2018 and Most Admired Top 5 list (as the no. 1 most admired U.S. firm and no. 3 most admired firm globally); and #1 Retail Design Firm on VMSD’s Top Retail Design Firms of 2016. Vancouver's Main Street to Undergo Fall Facelift with Addition of Aesop, Bailey Nelson, and Others: CBRE Brokers Martin Moriarty and Mario Negris have announced that Mosaic Home’s development at Main Street & 20th Avenue is completely pre-leased. Confirmed tenants include upscale Australian skincare brand Aesop and country-mates eyewear retailer Bailey Nelson, yoga and Pilates practitioners Lagree West, and an Heirloom Vegetarian Restaurant commissary. Vancouver’s Main Street is home to a vibrant restaurant/coffee house community with numerous ‘mom and pop’ markets and shops, indie designer clothing boutiques, mid-sized grocery chains, and an eclectic bohemian lifestyle atmosphere. It is being hyped as the next neighbourhood for densification as retailers seek accessible retail space outside of the downtown core, Gastown, and Yaletown. This development could be the beginning of some big changes for the area, though Mr. Moriarty said in an interview that he doesn't expect this stretch of Main Street to transform nearly as rapidly as Gastown, which is undergoing a gentrification transformation. Retail Real Estate Alert: Rossmere Plaza, 1070 Henderson Highway Winnipeg (via leasing newsletter Locations!) Rossmere Plaza has 3,740-square-feet for lease on the lower level. According to the Agent, Shindico, this is a busy neighbourhood centre featuring a new facade. The site has excellent access, exposure, an abundance of parking and a dynamic mix of tenants said Sandy Shindleman. The plaza has 514-feet of frontage on the Henderson Highway. The following tenants are already located at Rossmere Plaza: Tim Hortons, Dairy Queen, Little Caesar’s, Rossmere Medical, Rossmere Pharmacy and the recently expanded Henderson Library – Winnipeg’s second largest library branch. Genesis Motors Opens Showroom at Toronto's Pearson Airport South Korean Hyundai-owned Genesis Motors is expanding its base of stores across Canada. The retailers recently launched a new brand experience centre at Toronto Pearson International Airport, working in partnership with the Greater Toronto Airports Authority (GTAA). Located in Terminal 1’s Domestic area at Gate D20 (the busiest airport sector in Canada) the new centre offers travelers the opportunity to learn about the industry’s newest luxury brand and see Genesis products up close. Toronto Pearson is Canada’s busiest airport and the second largest international passenger airport in North America. The boutique-style brand centre is a unique opportunity for travellers to connect with the Genesis brand while they wait for their flights. This experience is another example of how Genesis delivers on its “We come to you” brand promise. The South Korean Hyundai-owned Genesis Motors launched as a standalone marque in November of 2015 and in November of 2016, the company launched its Canadian eCommerce site. Lululemon Competitor Lolë Announces Expansion into Men’s Wear: Canadian athleisure wear brand, Lolë, founded in 2002 in Longueuil, Quebec, known for catering to the active urban customer specializing in women’s apparel for yoga, running, swimming and other activities, as well as casual fashion apparel, has announced the expansion this fall of its lines to include men’s wear. CEO and yoga business guru Bernard Mariette sees the men’s business becoming about 30 percent of the Lolë products and to handle the new business, Lolë will open U.S. headquarters in Los Angeles this summer. Lolë is perhaps best known for organizing free events focused on well-being which includes yoga - the brand’s primary fitness pillar. The brand’s largest experiential concept, coined “Lolë White Tour,” consists of multiple gatherings throughout the year, which have been attended by more than 50,000 people in cities such as Paris, Barcelona, Toronto, and New York. Dish & Duer Invites You to be a Do-er! Vancouver-based apparel start up, DUER Performance, is tackling your closet woes with a denim recycling program running in store through June 30. Clean out your closet. Help out the community! Bring in your gently used denim to their Gastown flagship (118 W. Hastings Street), and they'll donate it to Covenant House Vancouver. You'll also get $25 off your next purchase, so you can feel as good about stocking up as you do about dropping off. The Denim Recycling program runs June 11th through June 30th. Gently used denim can be dropped off at the DUER flagship store at 118 W Hastings. The $25 credit can be used towards all at once purchases of full priced items, excluding shorts. DUER Performance is a clothing company that combines fashion and function. Their line of jeans, pants and shorts infuse technical fibres into natural fibre rich fabrics in order to create clothes that feel better, move better, and last longer than traditional clothing. DUER is sold around the world, in select partner retailers, and in their Gastown flagship store at 118 W Hastings St. For more information, visit http://www.duer.ca. 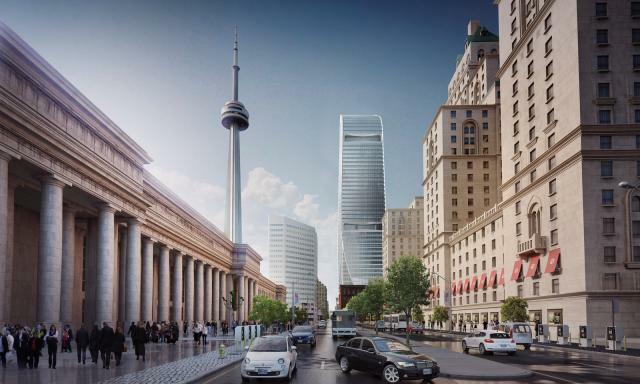 Cadillac Fairview Boosts Investment in Toronto's Downtown with $800 Million Office Tower: Cadillac Fairview, known for its leading shopping centres, has announced a new 46-storey office tower at 160 Front Street West, on the northeast corner of Front and Simcoe Streets in Toronto. Designed by Adrian Smith + Gordon Gill Architecture, in collaboration with B+H Architects, the building will incorporate the latest in smart building technology and is designed to achieve LEED® Platinum and WELL Building Standard® certifications. The development will feature 1.2M-square-feet of office space, 339 parking stalls, 12,290-square-feet of retail space and is slated to open in the fall of 2022, with the building's inaugural client being CF's owner, Ontario Teachers' Pension Plan, which will relocate their head office from North York. Located one city block from Union Station and with easy access to the Gardiner Expressway, the site is well-positioned to appeal to prospective clients concerned with ever increasing traffic congestion in the city and superior transit access. Nearby amenities include a diverse range of retail, food, restaurant and hotel choices. Photo: Quinn Design Associates Inc.
StoneHammer Brewing Abruptly Closes Down Operations: The Guelph Ontario-based brewer and beer retailer StoneHammer was adjudged bankrupt on May 30, listing $1.5-million in liabilities. No official announcement was made by the brewery, and the workers were terminated without notice. StoneHammer was founded in 1995 by Charles MacLean and Rich Fortnum and has been owned by Phillip and Lesley Woodhouse since 2015. There are approximately 250 craft brewers in Ontario competing for shelf-space, and insiders say the market is over-saturated and this closure may be the first of many as craft beer brewer’s fight to gain a toehold on the existing shelves or are forced to venture out of province with their kegs. BDO is the bankruptcy trustee. Miller Thomson is counsel to the applicant creditors.